Providing parents with picture-based instructions – and with dosing tools that closely match the amount of medication needed – may help reduce cases of medication overdoses in children, researchers say. Poorly designed medication labels and dosing tools lead to dosing errors, especially when parents are given large cups for small doses, the study team writes in Pediatrics, June 27. “Parents frequently make errors in dosing medications for their children. We did this study because we wanted to find out how to redesign medication labels and dosing tools to help parents understand dosing instructions better,” lead author Dr. Shonna Yin told Reuters Health in an email. It is important for parents to use a tool that has markings on it to help them measure out the right amount. 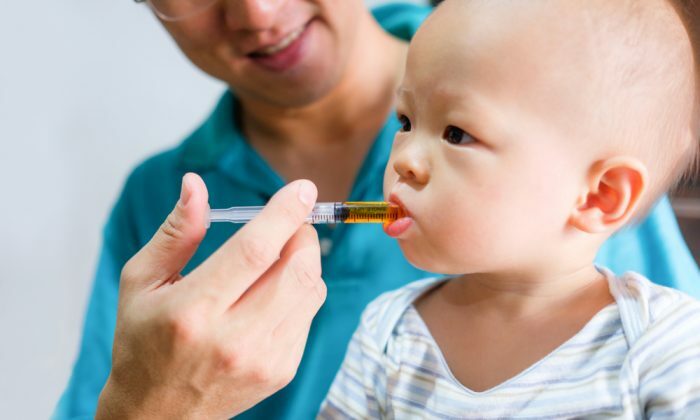 It is very easy to get confused when dosing liquid medications for a child, said Yin, a pediatrician at NYU Langone Medical Center in New York City. “To help make sure they give the right dose, parents should ask their doctor or pharmacist which dosing tool is best to use,” she said. The researchers recruited 491 English- and Spanish-speaking parents of children age 8 years or younger, and randomly assigned them to one of four groups, each with a different combination of medication labels and dosing tools including assorted cups and syringes. Parents were given a medication label with instructions in text only, or both text and pictograms, plus dose measuring tools marked only in milliliters (mL) or in both mL and teaspoons. Participants were asked to demonstrate how they’d use the labels and to measure three different dosage amounts using three different tools. About 84 percent of parents made at least one error and almost 30 percent made at least one large error such as doubling the correct dose. There were fewer errors, however, when labels contained both text and pictograms and when dosing cups or syringes were close to and at least as large as the amount of medication needed. For a 2-mL dose, for example, the fewest errors were seen with the 5-mL syringe and for the 7.5-mL dose, the fewest errors were with the 10-mL syringe. In addition, parents were about 30 percent more likely to make mistakes when they used tools marked in mL and teaspoons compared to mL only. “It is important for parents to use a tool that has markings on it to help them measure out the right amount. This could be an oral syringe, a dropper, a dosing spoon, dosing cup, or even a measuring spoon that is usually used for cooking,” Yin said. When using any of these tools, parents should carefully check to see that the number and the units used on the tool match what they are trying to give, she added. “Mixing up milliliters and teaspoons can lead to a parent giving 5 times the dose. If there is no dosing tool at home that has markings on it, I would recommend going to the store to get one or trying to get one from the doctor or pharmacist,” Yin said. “The study makes it clear that it’s easy to make mistakes with liquid medicine and that using the right syringe can help and that instructions with pictures help as well,” said Dr. Kathleen Walsh, director of patient safety research at the James M. Anderson Center for Health Systems Excellence at Cincinnati Children’s Hospital in Ohio. “There are certain medicines that people tend to think of as safe but actually if you make a big dosing error can be very dangerous, for example, Tylenol or Benadryl are medicines you really want to be careful to give the right dose,” she said. Is a Sweet Placebo Best for Coughing Babies? Here's a all-natural weight loss plan and home workout to help you burn the belly fat! Stop listening to marketing and social media feeds that are telling you how you should look. Ritual slaughter is illegal in New Zealand, Switzerland, and the Scandinavian and Baltic countries.